An absorbing video that adds to the appreciation of the conditions after the first landings as the Allies fought to break through the German defenders and race towards Germany and the end of the war. With the humour for which the British Army is well know, the proven ace gunner Ekins was never again allowed to serve as a Firefly gunner. DESCRIPTION: The Sherman tank was produced in large numbers and many were shipped to Britain to join the D-Day landings. The basic Sherman with its 75mm gun was no match for German Panther and Tiger tanks and its habit of bursting into flames when hit earned it the unfortunate name “Tommy Cooker”. British tank workshops were kept busy modifying basic Shermans to fit them to specialist roles and to enable them to take on German armour on more equal terms. For D-Day, many Shermans were modified to allow them to swim or wade ashore. Others were modified to work as flamethrowers or anti-mine flails, others as beach recovery vehicles to push landing craft off the beach or recover flooded vehicles. Then there were specialist armoured engineer vehicles and bridge layers. The list of modifications was long, but in pride of place must be the Firefly Sherman. This variant shoehorned the British 17 pounder gun into a modified Sherman turret. The breach of the gun filled the center of the turret, effectively dividing it in two. To accommodate radio equipment that was normally mounted in the back of a Sherman turret, a bin had to be built on the outside of the turret rear. The flash and noise was significantly greater than that of the standard 75mm gun and in the very short period available from the first Fireflies joining units and the embarkation of armoured units for the beach landings, an attempt was made to allow every Firefly crew the opportunity of firing five rounds on the training ranges. Trooper Ekins was one Firefly gunner who fired five rounds in training and then went into battle. This video includes interviews with Ekins and covers his epic battle with a number of Waffen SS Tiger tanks in Normandy. The new Firefly was in short supply so that Ekins was in the only Firefly in his unit, the others being standard Shermans. That placed the burden on Ekins and his crewmates who had the means to take Tigers on at ranges of up to 2,500 yards and win. In this battle Ekins came up against Panzer Ace Wittmann and killed him and his tank. 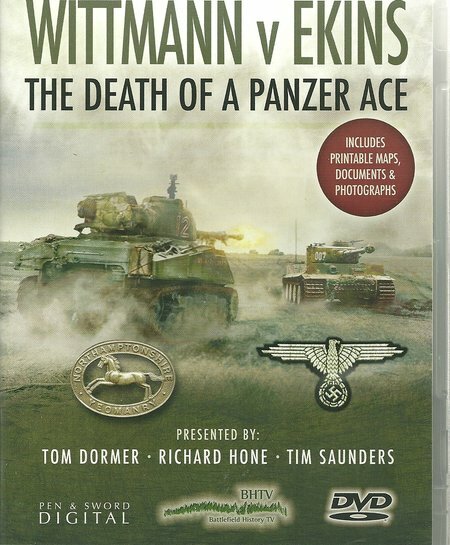 As in many battles with enemy aces, there were several claims from British tank and gun crews but the presenters convincingly demonstrate that Ekins was the victor and also destroyed other Tigers inspite of his tank being hit and its commander killed, Ekins then continuing under a new commander. The presentation and research for this video is first rate and the story is well told. An absorbing video that adds to the appreciation of the conditions after the first landings as the Allies fought to break through the German defenders and raced towards Germany and the end of the war. With the humour for which the British Army is well know, the proven ace gunner Ekins was never again allowed to serve as a Firefly gunner. In many other armies he would either have been promoted and used as an instructor, or deployed as a Firefly gunner to the end of the war.